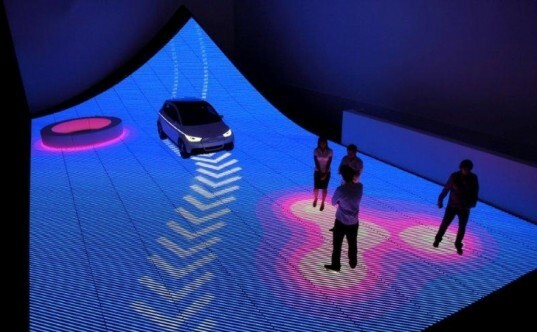 Audi and BIG showed up at Art Basel Miami last week with what could be mistaken as the latest dance floor design — a huge LED surface which illuminates and tracks humans. The floor and accompanying pavilion were disguised as entertainment but also acted as a large scale demonstration of“Urban Future,” a project focused on reclaiming transportation corridors in cities. The concept is based on integrating driveless electric cars into advanced roadways that guide the vehicles, eliminating curbs, traffic lights and other types of space-gobbling infrastructure to hand the city back to pedestrians. The project emanated from BIG’s winning proposal for Audi and BIG Demonstrate the Urban Road of the Future which they dubbed (Driver)Less is More, a play on their comic book YES is More that was released around the same time. Looking at the renderings you would not be blamed for thinking it was some kind of urban rave party. The proposal has streets embedded with LED lights which track the movements of everything and set priorities to best move traffic and pedestrians through the space. The concept is to increase traffic flow while liberating large quantities of land for other uses. The proposal came to life astonishingly quickly as a 190 square meter set co-developed with Kollision + Schmidhuber & Partner. The pavilion illuminates where people are standing or walking with LED blobs. Where more people gather, an illuminated cloud appears below them. The pavilion uses 3D cameras to detect humans and objects and feeds that information into a computer which then directs driverless electric cars through the streets. As people walk across the cars, their path changes and is indicated by the directional arrows. The pavilion also shows off the Audi A2 electric concept car which is about the same size as a Mini or Fiat 500. 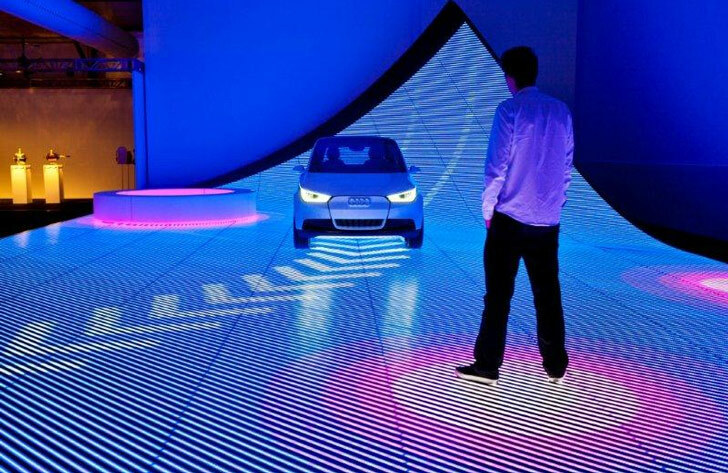 Audi and BIG showed up at Art Basel Miami last week with what could be mistaken as the latest dance floor design -- a huge LED surface which illuminates and tracks humans. The floor and accompanying pavilion were disguised as entertainment but also acted as a large scale demonstration of“Urban Future,” a project focused on reclaiming transportation corridors in cities. The concept is based on integrating driveless electric cars into advanced roadways that guide the vehicles, eliminating curbs, traffic lights and other types of space-gobbling infrastructure to hand the city back to pedestrians.